An organisation that urges Australian men to ‘soften up', a flash mob with a purpose, and a campaign to change Australia’s drinking culture are just of few of the projects presented by some of Australia’s young social pioneers at the National Conference on Volunteering. 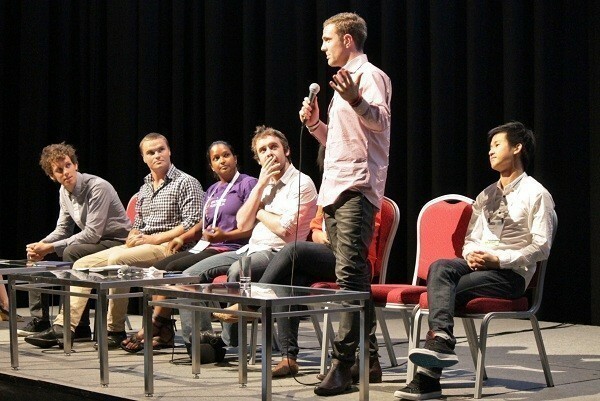 Seven outstanding young Australians shared with the conference how they are working to change the world through their innovative and inspiring projects. Introducing the young leaders, CEO of the Foundation for Young Australians Jan Owen said, “There has not been such an explosion of young people working for social change in this country, ever”. Elliot co-founded YGAP (Y-Generation Against Poverty), a movement of young people generating funds for projects around the world. One of the projects that Y-Gap are behind is Kinfolk Café, a Melbourne coffee shop that promotes ethical consumption, and reinvests its proceeds back into projects in the developing world – based on the customers preference. At the point of sale, customers choose where the proceeds of their purchase goes – to a project for homeless people in Melbourne, to support initiatives with indigenous Australians, or projects in Ghana or Rwanda. “When we said we wanted to open a café in Melbourne, everyone told us we were crazy,” said Elliot. The café was opened on a budget of $12,500, with furniture sourced from road-side hard rubbish collections. Elliot said the capital was paid off in 3 weeks, and $40,000 was delivered to partner projects within the first 4 months. Dawn’s aim in life has been to spread the message “you are awesome” to as many people as possible. Dawn has run a number of Not for Profit organisations, and currently works with the Foundation for Young Australians. Having grown up in apartheid South Africa – living in a tiny house with 14 of her family members – Dawn was one of two black girls sent to a school of 1000 white people. Dawn had never even met a white person before, and suffered bullying ad exclusion from her new classmates. Dawn says before she was born, “giants rose up in my defence” against racist apartheid, and they instilled in her an important message. 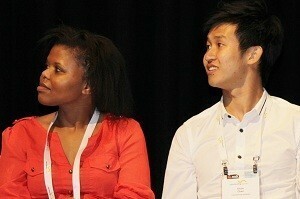 Above: Dawn Mlotshwa and Ehon Chan. Dawn started her own foundation in her backyard to spread the message, and “to piss off anyone who didn’t think she was cool”. As the inaugural director of the Oaktree foundation in South Africa, she travelled the country spreading the message “that you are awesome”. It’s a message she has brought to Australia, and actively shares with young indigenous Australians. The enigmatic Ehon Chan was born in Malaysia, where he started ‘Love in a Box’, an organisation that gets shoppers to donate Christmas gifts at shopping centres, which are wrapped and delivered by volunteers. When Ehon left Malaysia six years ago, the organisations had 30,000 volunteers. “If you have the right idea, the right resources, and the right volunteers – magic happens” Ehon said. Arriving in Australia, Ehon was shocked to discovered that suicide was the top killer of young people, and the biggest killer of men aged 14 to 45. Oaktree opened its doors 8 years ago, and today invests $1 million annually in development projects in the Asia Pacific region. It’s an organisation with huge reach – Jan Owen said one campaign saw $1.3 million raised from under 25 year olds in one week alone. Tom O’Connor from Oaktree said the organisation grew very quickly in its first 3 years, and became more professional in their approach. Their core challenge was around talent development. “How do we find the talent we need to run the organisation, and how do we train that talent?” asked Tom. So in 2008 Oaktree started its own graduate program, to train the organisations future leaders. Three years on and Tom says 25% of leaders within the Oaktree organisations have been through the program. Australia’s greatest untapped resource is Sunday morning, according to Chris Raine, a young Queenslander on a quest to change the nation’s relationship with alcohol. Chris said Australia has a culture where you drink at every event and occasion . “For young people, drinking is a right of passage,” Chris said. At age 22 Chris started Hello Sunday Morning, after seeing the way people drink in alcohol in Europe and other cultures. Chris blogged about his own personal experiences while spending a year without drinking. Surveys have shown that 79% of Australians think we have a national drinking problem – and Chris is aim is simple – to provide a way for these people to act. People sign up to the website, and set goals – such as health or wealth targets. There are now 2,500 people who are using Hello Sunday Morning to take a break from alcohol and reassess their own relationship with alcohol, and Chris hopes to get 10,000 members by next year. 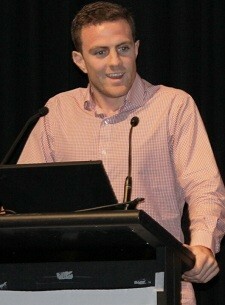 Above: Young Queenslander of the Year Chris Raine addressing the National Conference on Volunteering. Returning from volunteering on a community development project in Gautemala where he had made a really strong bond with the local community, Tim felt he had changed as a person. amongst his fellow students “complaining was the default way of communication”. “What struck me was the transition from the feeling of ‘us-ness’ in Gautemala, to the feeling of ‘me-ness’ in Perth,” Tim said. Tim started Big Help Mob to try and change attitudes and connect people back with their communities. “It’s like a flash-mob that’s useful” said Tim. “We get lots of people together…..and we turn them temporarily into super heroes,” said Tim. Big Help Mob takes people out into the community to do things like remove tonnes of rubbish, plant thousands of trees, or setup a red carpet, screaming crowd and fake paparazzi at train stations to thank people for using public transport. “One off social fun volunteering experience flicks a switch in people, and they go off and do more good.” He said. Tim said there is a lot at stake. “We could have a whole generation growing up feeling like they can make a different on anything that matters, and I don’t think that we can afford that”. Kumari founded Mayibuye, an organisation that uses dance and performing arts to inspire passion and purpose in disadvantaged young people. “Dance builds confidence and self-pride, and allows young people to express themselves,” Kumari said. She said dance is one thing that can cross cultural barriers. “Dance is a universal language” said Kumari. saw this session at the conference and it knocked my socks off! Awesome tots! My partner and I are both 27 years old and are just about complete 12 months without drinking. I sure agree it opened our eyes to how big of a problem it is. We say: if you have nothing else to do with your friends – change your friends!